The new exhibition, titled ‘The Story of the Estonian Chair’, on 100 years of Estonian chair design will be opened at the ENM's Gallery this thursday, 31 January. The exhibition, which was created in cooperation with the Estonian Association of Interior Architects, is curated by art researcher Harry Liivrand, designer Lilian Sokolova and interior architect Katrin Tammsaar. 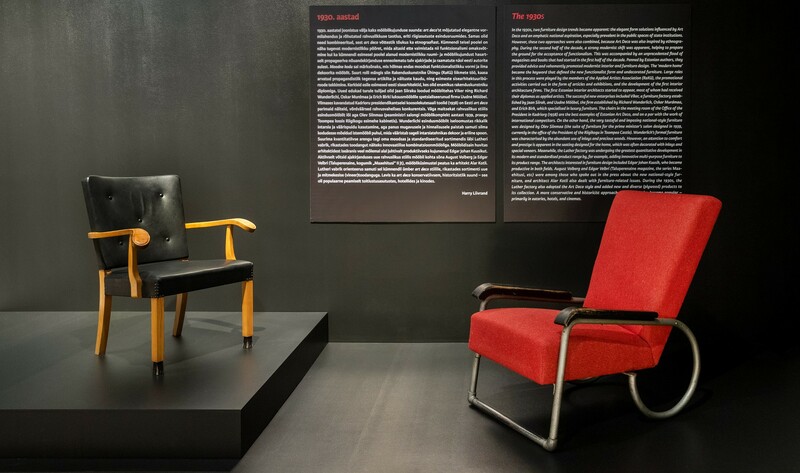 The exhibition examines the history of Estonian furniture chronologically and via style history from the beginning of the 1920s until the second decade of the 21st century. The ENM will be exhibiting iconic chairs that can be found in public spaces and in many homes, as well as chairs once popular but lesser known to people today. The exhibition will be open until 30 June 2019. Curator tours and meet-and-greets with chair designers as well as visits to the furniture collection of the ENM will take place from February. A catalogue in Estonian and English complements the exhibition. The Estonian Association of Interior Architects organised an open competition for the exhibition, with the ‘Story of the Estonian Chair’ project announced as the winner in January 2018. The producer of the exhibition is Reet Mark (ENM) and the graphic design is by Eva Unt and Margus Tammik (Unt/Tammik). The exhibition is supported by the Cultural Endowment of Estonia, Akzo Nobel Baltics and Fagerhult. The following supporting members of the Estonian Association of Interior Architects have also contributed to the exhibition: Bauhof Group, Decoland, E-Lux Kodutehnika, Elke Mööbel, Floorin, Geberit, Hektor Light, Jung, Lincona Konsult, Mass, Moodne Valgustus, Plaadipunkt, Plaat Detail, Puustelli, RM Stuudio, Tarkett, Villeroy&Boch Gustavsberg AB Estonian branch, Vivarec, Wermstock, InterStudio, Glamox HE, I.D. Kangas, and Björn Espresso Bar.